Download "The Ultimate Guide To Local SEO For Enterprise Business"
Helping Businesses Successfully Improve Their Search Visibility for 10 Years! Read some of our SEO case studies below and learn how our SEO strategies can help your business too. Take the guesswork out of your marketing in just one phone call. We’ll pin-point your local SEO problems and let you know the top 3 local SEO strategies you need to achieve your marketing goals. "Dev and the rest of the Powered By Search team has been wonderful to work with. With profound knowledge on SEO and Local search, they have always been very committed to their work and are a very friendly team that is always there to help you." 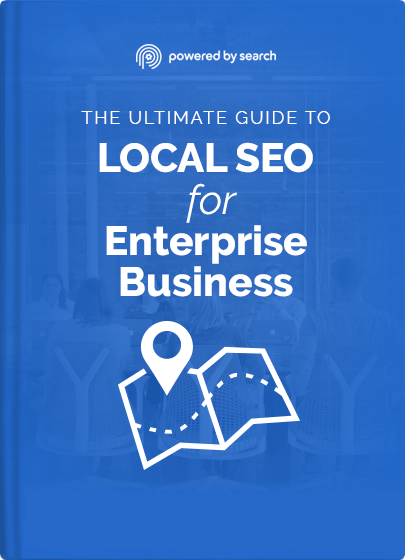 Instantly Download "The Ultimate Guide To Local SEO for Enterprise Businesses"
Download "The Ultimate Guide To Local SEO for Enterprise Businesses"
What is Enterprise Local SEO? A must-read guide to Local SEO. Are you the first business to pop up if someone Googles your offering in their city? Or is that sale going to the “other guys”? If you want to know how to win the local SEO war, this comprehensive playbook offers everything you need to know. We’ve been experts at Enterprise Local SEO for over a decade, and in that time we found that most other experts have a very fragmented view of the enterprise search landscape. This playbook is for you if you want to find the right Local SEO platform, know the key performance indicators, and understand the Enterprise Local SEO ecosystem. What is the state of the Enterprise Local SEO industry? Who are the leading players in this space? What skills should an in-house Enterprise Local SEO strategist have? Which Content Management System (CMS) is best suited for your needs? 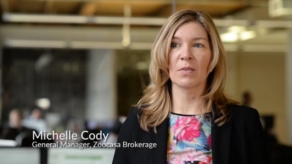 Why are most multi-location store locators failing? How is local PPC different from regular PPC? Gain organizational buy-in and alignment to support your local initiatives. Secure enough budget for your Enterprise Local SEO initiatives. Manage your Enterprise CMS, Store Locators, and identify your options to making your website assets Local SEO friendly. This playbook was created for those with an intermediate to advanced level of Local SEO knowledge. If you are a beginner at Local SEO, we recommend you go through our Local SEO Report Card, and Marketer’s Guide to Local SEO. Local Search Engine Optimization (LSEO) is a marketing discipline that focuses on increasing visibility for a local business in search engines like Google, Google Maps, Bing Maps, Apple Maps, GPS Directories, GPS Apps (Waze) and many other local directories (like Yelp or Superpages). Enterprise Local SEO is similar, but it also requires a deep knowledge of scaling SEO practices for companies with hundreds or thousands of locations. Why Should Enterprise Companies Care About Local SEO? Local SEO is not just for “Mom & Pop” businesses. Ever since Google’s Pigeon Update, any business can take advantage of showing up in Google’s search results for search queries that have local intent. Being visible in local search is an incredible way to attract people who are ready to buy. Local search queries have a much stronger intent to buy (as opposed to non-local search queries). Consumers search with their location in mind. 4 out of 5 consumers use search engines to find local information. 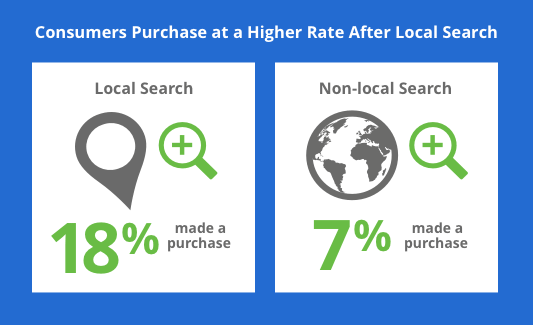 Local searches have higher purchase intent; 18% of local searches on smartphones led to a purchase within one day vs. 7% of non-local searches. Where Does Local Search Fit in the Online Digital Landscape? What Parts of a Google Search Result Are Local? Let’s explore this with an anatomy screenshot. 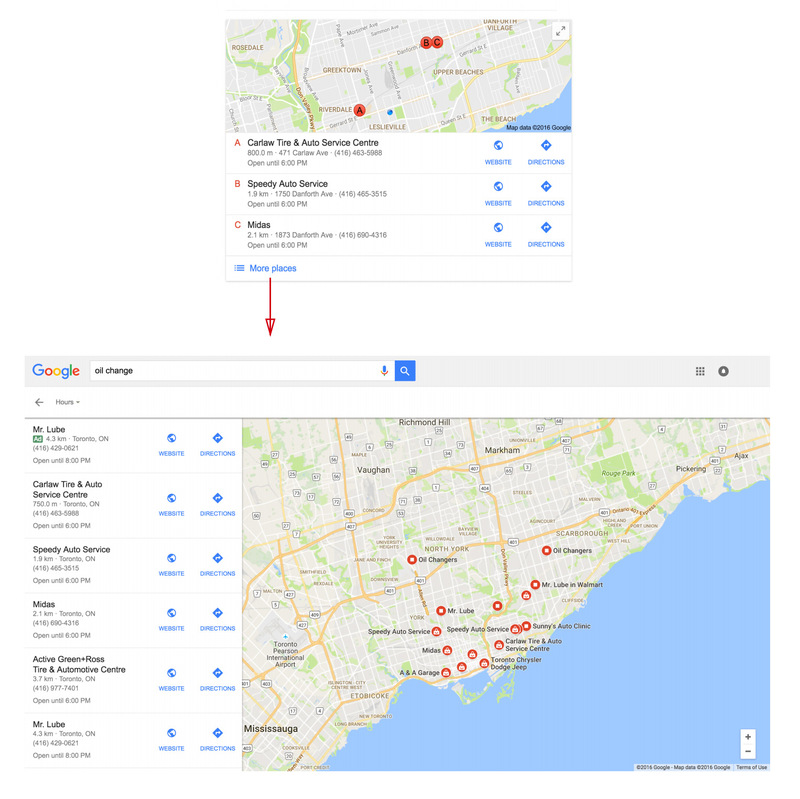 As you can see, Google shows local results in each part of the Google results page. If a search query shows Google Maps listings, it very likely has strong local intent. 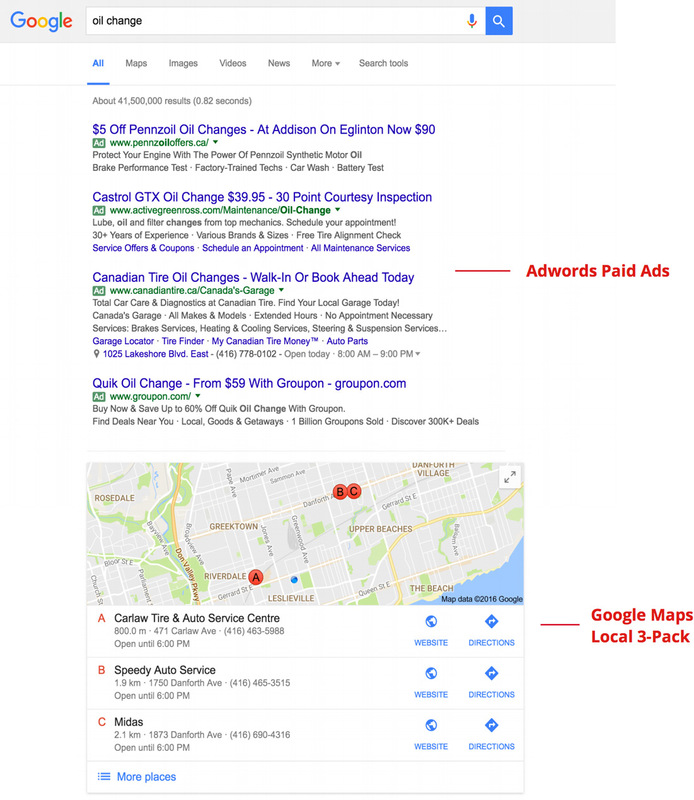 Google will show three different sections: ads (including map ads), the 3-pack map listing (which refers to the 3 results below the map), and organic website listings. If you click on the map listing and expand “more places,” you will see 2 map ads followed by a list of 20 organic map listings. How is Local SEO different from Organic SEO? There are many similarities between Local SEO and regular SEO. It’s still important that your website is optimized for technical, on-page, and off-page factors. But with Local SEO, there is an additional layer that deals with your data (usually referred to as your “NAP” information). NAP stands for Name, Address & Phone. It’s like the fingerprint for each business’ location. Reputation management is another layer of Local SEO. When you take reputation management into consideration, a whole new strategy and new steps are required to gain positive visibility in search engines like Google. In fact, the top local search ranking experts believe that there are 50 positive and negative ranking factors (according to Moz’s annual local search ranking report). Side note: Powered by Search is the only company with 3 staff members polled about the local ranking factors each year. Complete understanding of how Local SEO differs from regular SEO comes down to an understanding of how the local search ecosystem works. 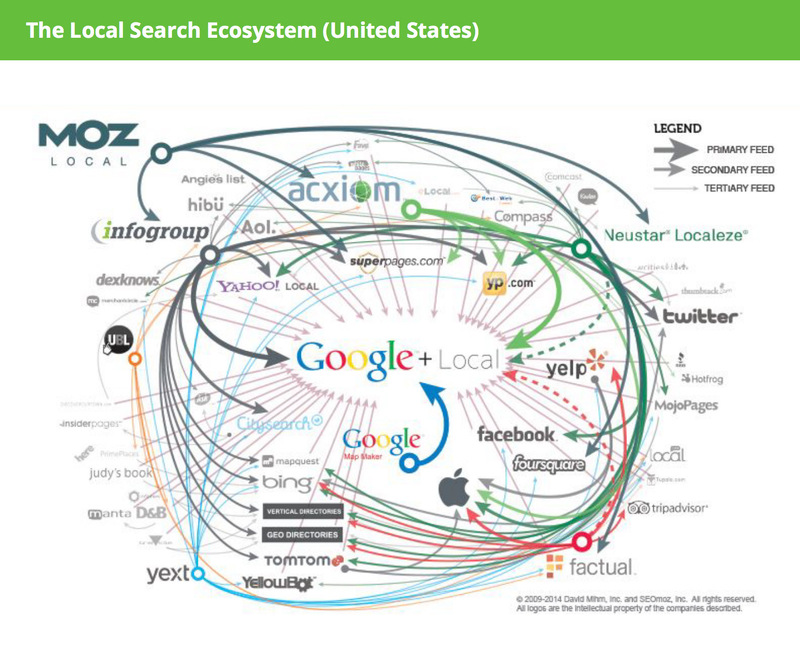 Below is a visualization of the United States’ local search ecosystem. 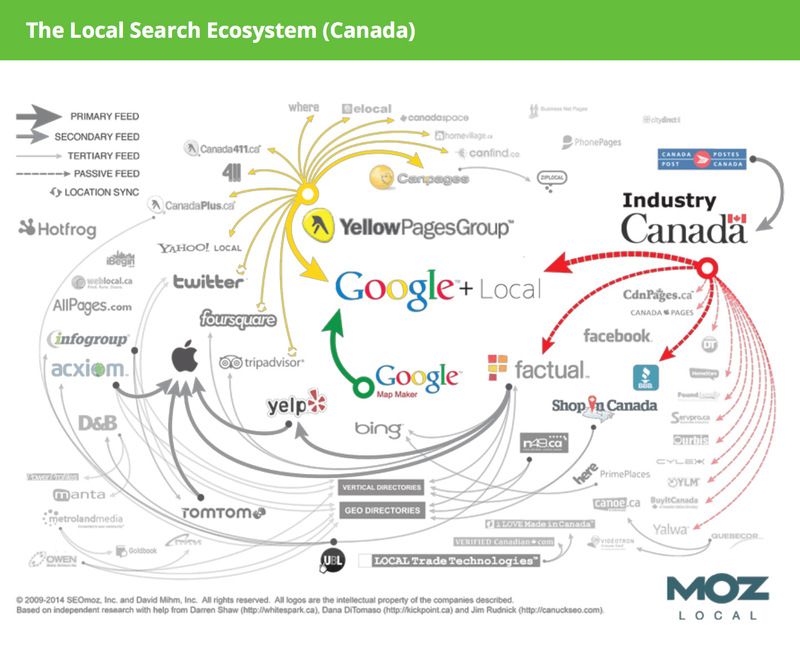 Below is a visualization of Canada’s local search ecosystem. As you can see, the local search ecosystem is vast and complex. Getting any of your NAP data incorrect in these systems can be deadly for an enterprise business. Tip for C-Level Executives: Enterprise businesses should consider syndication of their local data in their branding budgets. Incorrect local data can translate to a poor customer experience in circumstances such as an out-of-date business address or the wrong hours of operation. The following is an overview of each of the 5 pillars of local SEO, and best practices for your business. The need for having campaigns optimized for local intent has never been more important. As mentioned earlier in this article, 18% of local searches lead to a sale within 1 day. To be successful in local search, you shouldn’t just focus on the visibility of your main website. Each of your individual locations must be visible as well. This will provide searchers with relevant information to encourage them to convert locally. 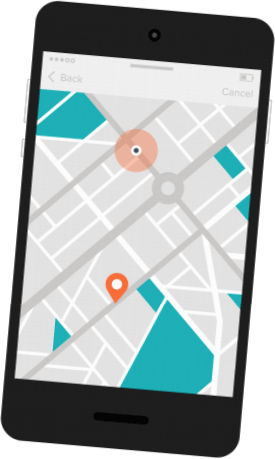 On mobile devices and even desktops, geolocation has an impact on what a user sees when they enter a search query. Queries that include the phrase “near me” have a direct local intent. Note: if not explicitly mentioned, this can be implicitly interpreted by search engines. In either case, search engines will return results that are as physically close to the user’s location as possible. Over 80% of people who use the internet now own a smartphone. There are at least 7% more queries on mobile in 2016 across all major verticals. “Near me” queries have jumped 34x since 2011 and almost doubled from 2014 to 2015. 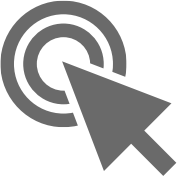 Paid search platforms have specific settings to narrow location-targeting for ads. Campaigns are built with explicit local searches in mind by including city, neighbourhood, or street keywords to appear for relevant queries. With geolocation, any targeted user that is searching within the Paid Search campaign set range of the campaign would be within the reach of your ads. To convert users with local intent, your business needs to have highly targeted, location-specific keywords and ad copy to reach the user and speak to their local needs. Paid search campaigns that are optimized for the user’s physical location will resonate more strongly than a national or generic campaign if the user is intending to convert locally. Linking your Google My Business to AdWords enhances user experience by including relevant local business information in paid search ads. Location extensions can be added to include business hours, reviews, and contact information. Include information about local landmarks, community events, etc. This is an important consideration when building out your landing pages for multiple locations. Always ensure that you have a unique page for each location and/or store. This opens up the opportunity for every page to rank in the search results, instead of just one page. Doing this will also provide more clarity to Google when they are crawling the page. More clarity for Google means you’ll see higher rankings in the search engine results page. Local listing management is the process of creating, optimizing, researching, updating, and maintaining business listings on websites such as Google My Business, Yelp, and Yellowpages. All of these websites make up the local search ecosystem. To do local listing management correctly you will need patience, a passion for problem-solving, and a proclivity for meticulousness. Having accurate and consistent business data across the local search ecosystem is one of the most important factors of success. It’s consistently listed as one of the top Local Search Ranking Factors. 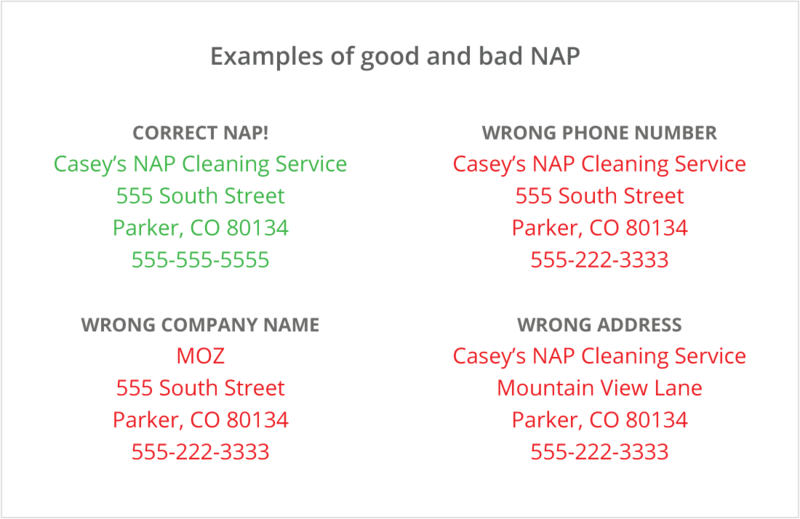 A “citation” in terms of Local Search means any mention of a business’ Name, Address, and Phone Number (NAP) on the web. Citations can be structured, such as on a business’ NAP listed on a Yelp listing. Citations can also be unstructured, like if it appears on a blog post, local community newspaper, or press release. The purpose of Local Citation Management is to ensure that these citations are as accurate and consistent as possible across the web. 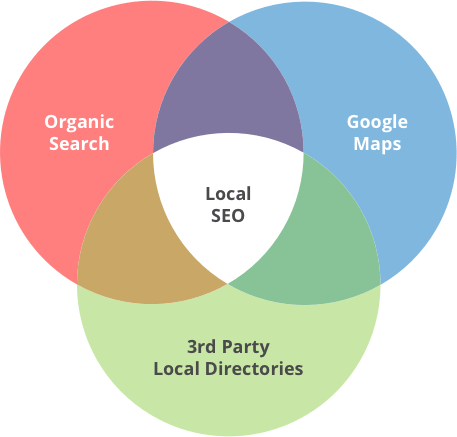 Organic local SEO is where traditional SEO meets local SEO. The goal of Organic Local SEO is to rank a website for queries that include a location. 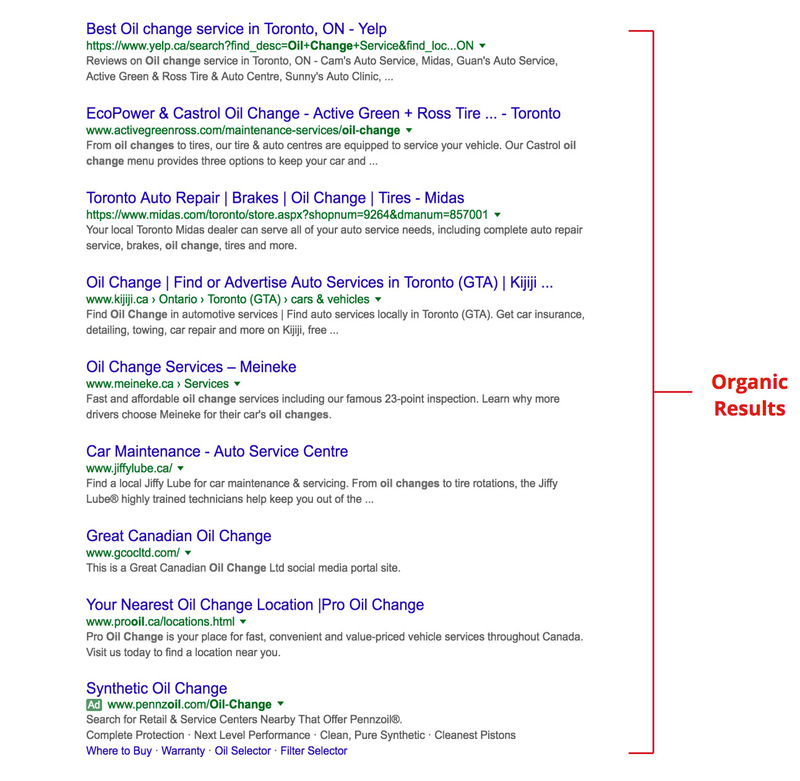 For example, a search for “Oil Change Toronto” (Local SEO), versus a search for “Oil Change” (Organic SEO). Traditionally, Local SEO strategy would focus on optimizing a website for “keyword + city,” but now with Google’s ability to understand a searcher’s location, and with the increased use of mobile devices, Local SEO must optimize for keywords without the city name as well. Your business data — and the consistency and accuracy of it — is crucial to the success of your online presence. No customer likes calling up a phone number that doesn’t exist, or driving down to visit a store that says it’s open on Google, but is closed when you visit it. Does your business have more than 10 locations? If so, you will want to invest in creating a data feed for your store information to easily manage and syndicate the most accurate and up-to-date information about your stores. Additional details such as your store hours, store landing pages, promotions, etc. Every major local search platform accepts data feeds in a slightly different format. At Powered by Search, we’ve developed proprietary ways to transpose your data accurately for platforms such as Google My Business, Bing, Yelp, and numerous other Internet Yellow Pages and Local Search platforms. It’s important to clean up your data so that only error-free and accurate information flows into the Local Search ecosystem. When you have data that isn’t organized well, your information is more susceptible to error, which can lead to upset customers. Data Normalization involves the process of organizing the different attributes of your store data (eg. Name, Phone Number, URL, Latitude, Longitude) into a relational database that is intuitively structured and error-free. When submitting your store data en masse to local search platforms, you’re implicitly vouching for the accuracy and recency of the data. Most local search platforms have built in algorithms to check whether the data they’re about to accept already exists in their system, including checking partially completed listings. Making your Local Data compliant involves following the various and ever-changing guidelines of each and every local search platform you’re syndicating your store data to. This process isn’t easy, but having compliant data means that nearly 100% of your local listing data makes it into the different search engines, directories, and GPS and mobile apps. These are the systems your customers use every single day to find your business. Would you like us to evaluate your store data for compliance with the various local search engines and platforms? We’d be happy to help! 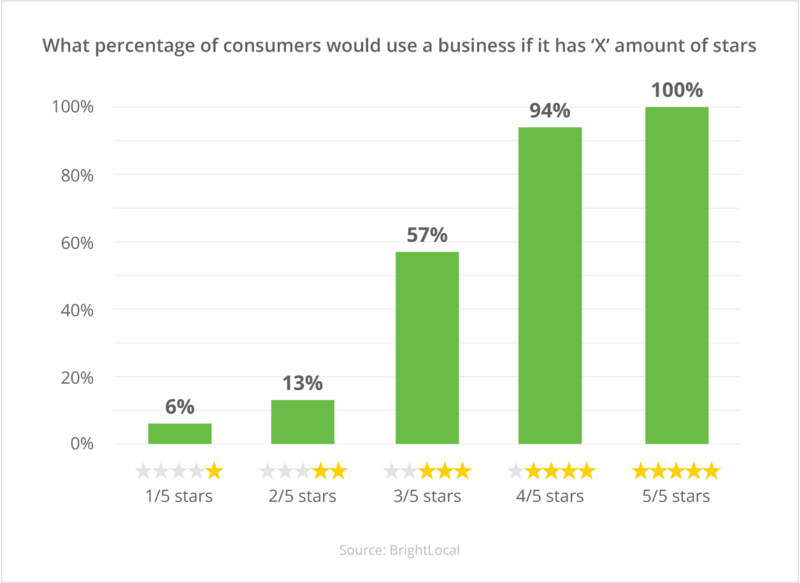 According to a study from Bright Local, 80% of people put the same trust in online reviews as they do personal recommendations. For instance: consider the last time you were choosing between two nearby takeout restaurants online. Chances are you were influenced by online reviews before making your decision. A solid review strategy should be a part of every digital marketing plan. Not only do reviews help convert potential clients into new clients, but they are also a big ranking factor in Google’s local algorithm. One thing to keep in mind is that Google and other important review sites have guidelines around consumer reviews that business owners and marketing agencies should be aware of. Mike Blumenthal wrote a great article on one of the more controversial “rules” that states that business owners can’t offer incentives for reviews. If you haven’t heard, check out the real reason why review incentives are bad. Enterprise Local SEO involves finding a way to implement SEO best practices on each and every page of your website. Doing so will involve working with multiple internal and external stakeholders within the constraints of time, budget, technological impediments, and organizational buy-in. Enterprise Local SEO best practices come in many unique flavours, depending on the size and scope of your business. Make sure each location has an independent page that is crawled, indexed, and shows up in search results for your domain name. To verify this, try typing site:yourdomain.com “store name/store address” into Google. If you have a franchise based organization, many of your stores will have similar products and services, with little differentiating information other than Name, Address, and Phone Number. These similarities can create duplicate or similar content issues. “Near me” searches increased by 86% in 2015. If you build a custom store locator on top of a bloated enterprise Content Management System, you may suffer from slow page load speeds. Page speed is a core ranking factor in mobile SEO, so it is crucial to load your store information as quickly as possible on a mobile device. Ensure that your newest content is indexed as quickly as possible. A Google algorithm called Quality Deserves Freshness (QDF) will display fresh information at the top of its search results. Google rewards websites that tag and wrap data into microformats such as Schema.org, enabling rich snippets to show up in the search results. These allow your brand to get more virtual real estate and to stand out in the search results. Incorrect implementation can lead to errors and an inability to show up with rich snippets. Because your website uses the same data feeds as competitors in your industry, Google sees a large percentage of duplicate content. Your site architecture must allow new content to be easily discovered. Archaic CMS configurations can be challenging to navigate. In the race to the top, how quickly you can get your content crawled, indexed, and ranked is of utmost importance. If you can’t be the fastest to market, you will need to increase the authority of your domain so that Google and other search engines favor your results over your competitor’s results. Building domain authority is a slow and arduous process, but the benefits are worth it. Your brand has a presence nationally, or in two or more countries, and may also have multi-regional, multi-lingual support. This increases the complexity of Local SEO since your website needs to serve a diverse audience. Employ a unified and holistic strategy to help Google and other search engines understand the relationship between your brand’s different domains, subdomains, or international subdirectories. Assist Google in serving localized content above the parent brand’s content (e.g., homedepot.ca vs. homedepot.com) even if the regional domain has lower domain authority. Increase local search discoverability by creating store profiles in multiple languages. Understand local search KPI data for all your stores at a national or regional level. Due to having multiple stakeholders in every region, you’ll need to improve alignment to make global Local SEO decisions. You may have to deal with exclusions and legal policies in which certain content works in a particular country, but doesn’t work in another. You may have to deal with content that exists in one or more languages, but does not exist in all languages. Every month, 1.5 billion people walk into businesses that they found on Google. Mobile traffic is growing at an exponential pace and has high local intent, with 30% of all searches being a location search. It’s no surprise that 76% of all mobile-local searches lead to an in-store visit. More importantly, 28% of all mobile-local searches result in a purchase. Despite investment in overall SEO expecting to reach $80 billion in 2020 (Borrell & Associates), Enterprise Local SEO budgets are still only a fraction of Paid Search and holistic Organic Search budgets. The long-term benefits of Local SEO are undeniable. Organic Search results get clicked 8.5 times more often than Paid Search results. Regardless, SEMPO, the Search Engine Marketing Professionals Organization, estimates that 87% of search engine dollars are spent on PPC vs. 11% on SEO efforts. It requires more effort than Paid Search in terms of organizational alignment, support, third party agency support, platforms, and technology flexibility. So is the juice worth the squeeze? Short answer: absolutely. As stated above: SEO receives 8.5 times as many clicks for every 1 earned from PPC. Given the conversion rate of both SEO and PPC, SEO generates 5.66x the revenue opportunity per click. At a higher return per click, marketers who double down in their SEO budgets have a high-leverage opportunity to seize the day. According to BIA/Kelsey’s U.S. Local Advertising Forecast, local advertising revenues in the United States alone are going to exceed $146 Billion in 2016. 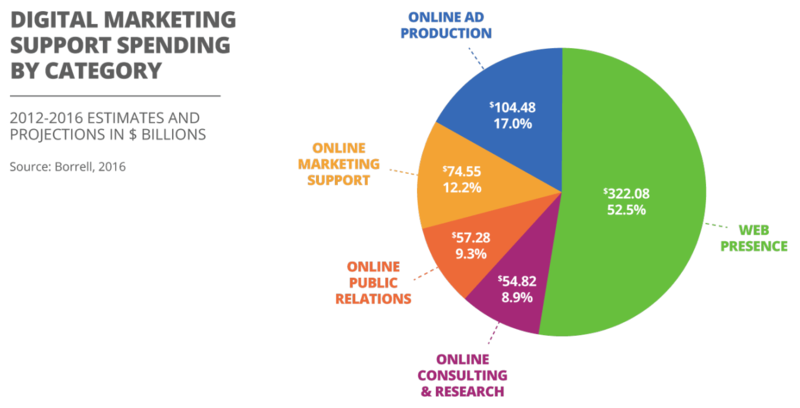 While traditional local channels remain important, online and digital marketing channels continue to grab market share. Traditional advertising spend is expected to remain largely flat through 2020, while online and digital revenues will account for most of the growth. Local SEO accounts for 12.2% of all Digital Marketing Services budgets. Single-use and all-in-one platforms continue to grow, with most tools and platforms offering more mature solutions. The space continues to see a lot of fragmentation, with very few real leaders in the platform category. All-in-one platforms are expanding capabilities to match those of single-use apps. Agencies — frustrated with a lack of mature solutions in the market — are continuing to build out single-point solutions for reporting, link analysis, penalty recovery, and other specific scenarios. For a large organization, Enterprise Local SEO requires a team comprised of several roles to efficiently operate. Due to the complexity and scale of large websites, meeting your SEO goals will require skilled experts with varying degrees of expertise and responsibilities. Specialist: These are Local SEO foot-soldiers. They are responsible for directly performing tasks such as keyword research, on-page optimization, or building links. Large enterprises will likely not employ Specialists directly, instead choosing to partner with an agency that fulfills this role, particularly if they have many locations. Strategist: An SEO or digital marketing strategist role is the most skilled and experienced individual contributor on the team. They can occasionally perform the same tasks as Specialists, but are more often required to use their mastery of SEO skills to provide solutions to complex problems, lead enterprise-scale audits, and define SEO strategy from a technical point of view. An enterprise team may have Strategist(s) in-house or through an agency. Manager: In-house, the manager is responsible for leading the team of Specialists and Strategists to accomplish the department’s goals. They also often serve as the main driver and point of contact with agency partners. An effective manager will possess well-rounded digital marketing skills, and likely, past SEO experience. Director: This role is responsible for meeting the organization’s key business objectives set by the Executive team and ensuring that the marketing department is returning positive ROI. A director will lead and oversee the department’s management team. In other management structures, they may directly lead Strategists and Specialists. Executive: This role sets the direction and strategy for the entire marketing department to drive the organization’s goals. While this role can be far removed from day-to-day SEO efforts, they are still deeply invested in the overall performance of the team. They are ultimately responsible for budgeting decisions and organizational buy-in for SEO initiatives. The definition of what SEO means has rapidly grown over the years. As such, many people who used to include “SEO” in their job title have transitioned to other roles. According to the 2016 Inbound Marketing Jobs Salary Guide from Conductor, for the first time in years, the SEO job market declined 6% in roles and about 7% in average pay. The strongest decline was in SEO Coordinator roles (19%). However, rather than this signifying a decline in SEO, this is regarded as a positive sign that SEO is becoming more of an essential skill rather than a dedicated role in itself. It means that marketers of any title should possess some SEO skills in order to effectively perform their role, and is further evidence that every organization must possess a strong foundation in SEO. The KPIs used by enterprises differ significantly from those employed by small and medium sized businesses. With Local SEO, there is another layer of metrics to pay attention to on top of the traditional SEO metrics. These metrics are pulled directly from the Google My Business (GMB) Dashboard and track activity specific to the GMB listing. “Insights,” as they are referred to by Google, track activity on a GMB page in regular search results, Google Maps, and from the Local Knowledge Graph. Every store location that has a GMB listing and presence on Google Maps should be paying close attention to their GMB insights. These metrics provide valuable data on the overall visibility and engagement for each individual listing. Search Views: The number of impressions your listing received across Google Maps, Google Search, and Maps for mobile. Google+ Page Views: The number of impressions on your Google+ page. Post Views: The number of times the posts from your Google+ page were seen. Photo Views: The number of impressions on your Google+ photos across all of Google’s properties. Click insights allow you to see the number of clicks on your GMB listing across the last 7, 30, or 90 days from a local search result. This includes the clicks on driving directions, clicks to your website, or clicks on your business’ phone number. For more information, see the Google My Business Help Resource on viewing insights for your business listing. Every business, no matter the size or industry, should consider these KPIs when examining their Local SEO performance. Each KPI below is associated with the Organic channel (visitors from non-paid search results) which is a segment within any analytics tool. Search Traffic: How many visitors come to your website from organic searches? How does this compare to your marketing objectives? What should your marketing objectives be, given market placement and business factors? Store Visits: How many people are physically visiting your location? If your store locations are where sales are closed, this is one of the most important metrics to track. Conversion Rate: Local SEO impacts the conversion rate of a website by both funnelling traffic to preferred landing pages and identifying opportunities for improvement. Leads or Sales: How many leads or sales are attributable to the organic search channel? The challenge for enterprises is in accurately determining these numbers, even though they are not always straightforward. 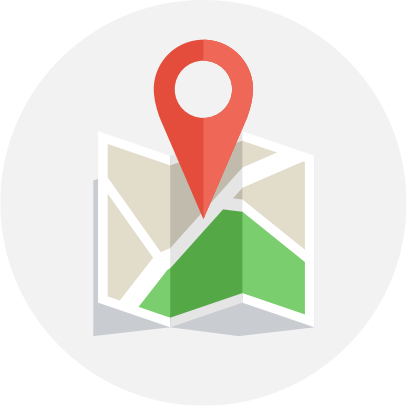 How does your business track a user who found the website and then went to a retail location? The indexation ratio is the comparison of how many pages on a website are indexed vs. how many total pages you have on the site. Enterprise organizations with hundreds or thousands of store locations will likely have a website that is similarly sized. SEO best practices still apply here. For search engines to show unique content about your organization’s locations, they need to be discoverable in a search engine’s index. A nationwide franchise organization may have unique pages on their website for information about each location. If the content is not fully indexable for search engines, entire regions of the organization’s reach may be hidden to interested searchers. A consistently high indexation ratio for all location pages on an extensive website must be regularly monitored and improved. How many pages does a search engine crawl each time it visits your site? The answer is your crawl budget. A search engine favours the most relevant and high-quality content when keeping its index of web pages up to date. Ensuring that your local landing pages are indexable and valuable can encourage crawlers to return on a more regular basis, allowing your organization to have new content quickly available to searchers. Websites with poorly managed crawl budgets can risk search engines avoiding revisiting the page for weeks or months. For many enterprises with multiple store locations, thin content can be a constant concern. A local landing page that publishes little more than address information may risk being overshadowed by higher quality content from local competitors. For Enterprise Local SEO, it’s important to understand the depth of content your local landing pages need in order to rank, and also to ensure that the solution is scalable across hundreds of locations. Content fragmentation on enterprise-sized websites can be due to a number of reasons. However, it is crucial to ensure that key local landing pages contain the highest quality and most up-to-date content to increase their search ranking. A lack of consolidation creates massive issues for enterprise websites, and minimizing fragmentation should be a focus. It’s urgent to make short-term and long-term plans that are aware of the flexibility and power of your Enterprise Content Management (ECM) or Content Management System (CMS) — the software category that is the foundation of most modern websites. Most of the these have help centres and communities where you can learn more information about the limitations and opportunities. The flexibility of your ECM or CMS will affect your success in Local SEO. Overcoming Enterprise Local SEO challenges is rewarding and will positively impact your bottom-line. But more importantly: choosing to ignore them can be catastrophic. This section covers the Local SEO challenges that enterprises must face head on. Local SEO tactics will vary depending on who is responsible for them in an enterprise’s organizational structure. IT: Local SEO is often grouped with Technical SEO projects. This can bottleneck their implementation, as most SEO related tasks are often put on the back-burner of non-SEO related projects. Marketing: Local SEO may be grouped into content strategy and content marketing. The trouble here is that Local SEO is easily undervalued. In this case, continuous education for the marketing team is the best route. A force-multiplier in Enterprise Local SEO is identifying and solving the technical challenges that affect performance. Inflexible CMS/ ECM: Enterprises are far more susceptible to the limitations of technology than small and medium sized businesses. Enterprises are also the target of aggressive sales tactics, which might fail to illuminate the limitations of the recommended products. GMB / Local Search Guidelines: Google My Business has lengthy Guidelines on how to represent your business on Google. They are updated often, and abiding by them can make the difference between your phone ringing and your listing being suspended and deleted from Google Maps. DID YOU KNOW? Powered by Search’s Agency Manager, Colan Nielsen, is a Google My Business Top Contributor and a Google Map Maker regional lead. Having these affiliations gives Colan great power to expedite Google Local issues. Low Indexation Ratio: How many of the hundreds of thousands and (in some cases, millions) of pages on the company’s domain and subdomains are recognized by Google? Anything less than 80% means there’s a lot of room for optimization. 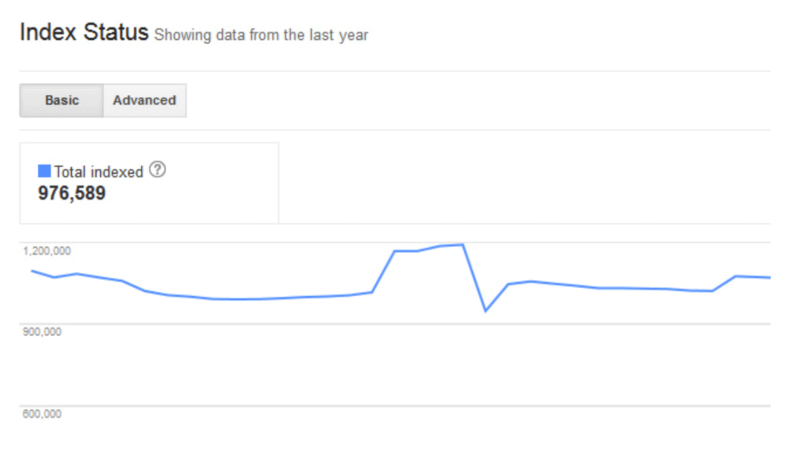 Changing pages from invisible to visible in Google means that they can now rank for long tail search terms. Disorganized Content: Generally speaking, you’ll find too many pages with too little content, and other pages that blindly address every topic under the sun (known informally as “frankenpages”). Both of these examples have poor keyword targeting. The solution here is to start enriching thin pages with content mapped to keyword intent while breaking apart frankenpages into thematic silos. Poor Internal Local Linking: Great content tends to be buried within many levels of the enterprise site’s directory structure. Improving internal linking is a low-effort, high impact way of funneling link juice from top level pages to content that deserves to rank in search results. Lack of Ownership: A different department may be responsible for local content, or there may be no single owner at all. This can limit your flexibility when changing or improving your content for local search. Multiple Versions of Content: Store-specific information changes, which can lead to great confusion and disappointment if improperly managed. There is nothing worse for customer experience than going to the wrong location (or the right location at the wrong time) because your business location and hours are not listed correctly. In some cases, different locations may also different products and services. CMS Disparity: You might have so much fragmentation that your local search objectives rely on content within a hard-to-access (or downright inaccessible) system. In this case, you cannot access content without your IT department. Zombies: Some of your content may represent offers, services, or marketing tactics that are long outdated. If left on your domain, this content can upset or confuse customers for years after its relevancy. Heavy Process: Local SEO is influenced by an enterprise’s agility or lack thereof. With competing objectives, role changes, and significant hierarchical boundaries, there are many elements that slow the entire process down. Priority: Enterprise Local SEO plans should always have multiple variants, each with its own legitimate business case. But ultimately, priority will impact execution speed. Content Originality: Publishers fight for quality content creators and work towards generating traffic from both their primary readership and content aggregators. Massive media organizations have their content re-published across their portfolio of distributors, leading to duplicate content across multiple domains. Scale: eCommerce websites struggle to have relevant, persuasive, and actionable content for each item. 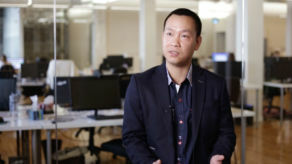 For small and medium sized eCommerce businesses, this is less of a challenge. In the enterprise space with potentially millions of product pages, the cost of creating content is enormous. Overspending: Multi-Location Real Estate and Automotive websites look to provide accurate and valuable data across smaller regions. In some cases, they tend to overspend on content. Quality vs. Quantity: SaaS and service providers struggle to balance between quality and quantity of content. Regulations: Businesses in the financial, legal, insurance, and health industries need to follow strict legal requirements for their content. Laws vary based on region and may affect claims, guarantees, testimonials, and superlatives. Strike a balance with technical SEO to ensure that the website and local landing pages are fully discoverable in search. Optimize the website for on-page SEO factors to meet best practices and adhere to local SEO ranking factors. Utilize offsite link building, citation management, and digital PR efforts to maintain local listing consistency and authority. Across the organization, the Enterprise Local SEO team must be mindful that they cannot operate in a silo separate from the marketing team. They must ensure that there is alignment with local store marketing efforts, paid search campaigns, and overall strategic marketing goals. Understand how search engines discover your website and local landing pages. Identify and target the highest volume and most impactful local-intent keywords that lead to positive ROI across multiple store locations. Optimize website content for local keyword relevance, quality, and engagement with local audiences. Understand how the local search ecosystem views your organization’s listings in both authority and consistency across the web. Influencing how search engines discover your website on a massive scale for local intent searches. An Enterprise Local SEO expert must possess the skills and expertise to understand and control the visibility of local landing pages with respect to the searcher’s location and intent. For example: if you have 300 store locations across Canada, you probably don’t want your Toronto store appearing in Vancouver searches. Optimizing the on-page factors of hundreds to thousands of locations at scale. A skilled Enterprise Local SEO specialist must be able to scale efforts to optimize each local landing page, no matter how many there are. This requires strong keyword research skills to determine the right local intent keywords that will convert in every locale. It also requires the ability to make SEO recommendations that are easy to replicate. Managing the health, growth, and consistency of local listings for hundreds to thousands of locations. The integrity of an organization’s listings is critical to ensure its visibility in local searches. A skilled Enterprise Local SEO specialist must understand how to manage, track, and monitor local listings at scale. However, they must also focus on the details to optimize individual locations as opportunities arise. Drawing meaningful insights from large volumes of data. Local SEO management for hundreds of locations will generate massive amounts of data. An effective Enterprise Local SEO specialist must be able to discern what to optimize on a strategic level as well as what to focus on for individual store locations. This requires adept analytics and data analysis skills, including mastery of Microsoft Excel. A high level of comfort with tools such as Google My Business, Yext, Moz Local, and Bright Local are also valuable skills to have. In addition, an effective Enterprise Local SEO expert must be able to effectively break down silos across the entire SEO team, marketing department, and the organization as a whole. With a large number of stakeholders across multiple departments, implementing Local SEO campaigns at an enterprise scale cannot be performed in isolation. Buy-in from the marketing department is required to impact local optimization efforts across paid channels, PR, social, or even offline at the location itself. However, Enterprise Local SEO efforts also require buy-in from other key departments such as IT, Finance, and the C-Suite. An effective Enterprise Local SEO Specialist must be able to communicate across each department with the organization’s overall strategic goals in mind. Enterprise Local SEO requires mastery of numerous digital marketing tools to be able to fully research, monitor, and impact local search performance. The best Enterprise Local SEO tools must be able to scale to provide insights for hundreds to thousands of store locations, and in a way that provides meaningful intelligence for making key decisions. The recurring monthly costs of these local SEO tools can add significant expenses to your organization’s annual SEO budget. However, if used effectively, a well-stocked Enterprise Local SEO toolkit can be a powerful asset for strengthening your long-term local search success. Enterprise Local SEO platforms are comprehensive solutions to meet the main pillars of Local Search Optimization, from Local Listing Management and Landing Pages to Reputation Management. Their features include the ability to provide extensive data and insights across numerous store locations or reporting stakeholders. These platforms can be highly valuable for determining the overall ROI and strategic direction of your organization’s Enterprise Local SEO efforts. Enterprise Local SEO Strategies are hugely dependent on a number of factors: industry, number of brick and mortar locations, budget, current market placement, agility, aggressiveness or risk tolerance, existing infrastructure, and multi-team stakeholder buy-in. With that said, these are the top 5 Enterprise Local SEO strategies that apply to a good proportion of enterprise-class websites. Consider the insurance industry: home and auto insurance companies understand the need to have and maintain content that describes their services. This is a small amount of content that should be easy to both create and maintain. However, this industry also has a huge amount of region-specific searches. Take the following phrases for example: “Condo Insurance in New York” or “Car Insurance in Fort Lauderdale.” How does one create powerful, persuasive, and useful pieces of content that will pull in that aspect of the insurance market? Each of these data points can be put into dynamic content and used to tell a persuasive story. They are available through various APIs, which allow the creation of these dynamic pages on a massive scale. Note: Implementation can change dramatically between industries, what we’ve listed here is a general strategy. From an SEO expert’s perspective, a website is a series of pages that are strategically planned. Keyword research is the act of doing the research around which ideas are most valuable and represent a market. Keyword research is considered the groundwork that provides the foundation of any website. Enterprise websites have massive foundations. While the scope is somewhat intimidating, it’s even more frightening to consider that the foundation may have had little to no thought behind it, or that it’s old and falling apart. In many cases, we find that the best strategy for both short and long-term results is to refine this foundation, retargeting and expanding the keyword and content map to dominate the market. Every specific phrase and search query that you want to rank for should have a preferred landing page (PLP) that is targeted to that keyword. Often, we don’t see a landing page for each keyword that an organization wants to rank for or they have a thin page that does not deserve to rank for that keyword. 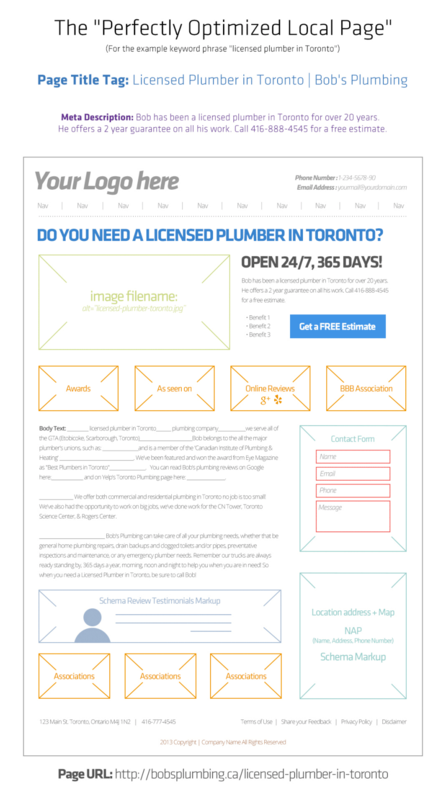 The strategy is to create PLPs rich in content that are scalable and still provide great UX to improve conversions. A site’s structure is like a web where each node is a page, and each page is connected to other pages by links. Links to your pages from your website are called internal links, and links from other websites are external links. A good rule of thumb is that your Preferred Landing Pages should have the highest number of internal links. Consider your site navigation: since navigation is available on every page of your site, it means that every link within the navigation is also on every page. Therefore, these navigation links must direct to extremely important pages. If your navigation links to pages that are not important, they’re stealing ranking and traffic power from other pages. An extremely effective strategy for enterprises is to establish the priority of each page (across sometimes millions of pages), and create an implementation plan that results in each page being internally-linked to according to its search potential and ability to achieve business objectives. NAP stands for Name, Address & Phone and to Google it’s like the fingerprint for each location. That fingerprint must be clean throughout the local ecosystem. Incorrect information listed on any of the local data aggregators can lead to duplicate listings and confuse the search engines. It can dilute the power of any of your citations and split reviews between multiple listings. There are endless problems if your NAP data is not correctly syndicated. The solution is to understand and control the sources of the local data aggregators so that only clean local data is syndicated. When this is done, business locations will gain better visibility, and ultimately provide a better experience for their customers. You can have top rankings and great visibility, but a poor reputation can cost you millions in lost revenue. If you have no reviews, even a few reviews for your competitor will easily steal attention away from your listing. Reviews are not only for Google. There many 3rd party review sites like Yelp, Tripadvisor, Scam.com, and Capterra. These other sites are important too because people will search for reviews before buying. This is what we call the Branding Consideration stage; the consumer is ready to buy, but want to check what other’s are saying about you. 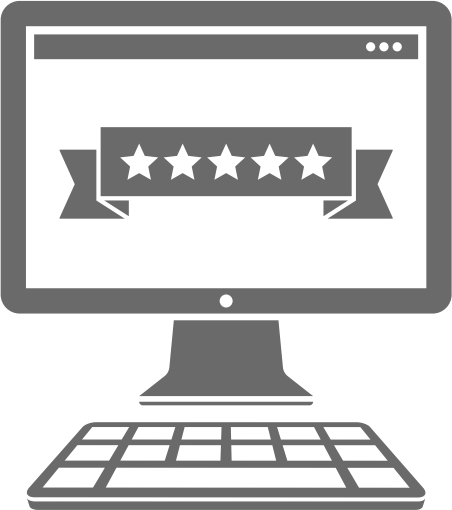 This is the reason it is vital to have an automated system driving reviews for your business. You want to have a reputation management tool that actively prevents negative customer experiences from ending up online, while driving positive experiences and reviews to a variety of 3rd party review websites. Powered by Search has a tool that does this called Powered by Reviews. It is possible to make a very small change to your website that causes catastrophic drops in traffic, leads, and revenue. In fact, we’ve seen this happen on several occasions with enterprise-class websites in the Telecom, Real Estate, and eCommerce spaces. Many decisions are made by developers, different lines of business, and third party vendors that are outside of a single enterprise’s control. The only way to ensure that issues are identified and addressed before there are significant repercussions is to constantly monitor the site’s health from an SEO perspective. To fully realize Local SEO initiatives and campaigns within a large organization, decision-making will involve numerous departments and stakeholders working closely together. The Enterprise Local SEO team must break down silos and ensure buy-in across the entire organization. Different stakeholders will have varying objectives, needs, and expertise in the Local SEO space. This creates the challenge of uniting the whole organization. Listed below are a few of the key stakeholders and what to keep in mind when working together on Local SEO initiatives. An SEO agency with expertise in Enterprise Local SEO can be a powerful asset for your organization. If your marketing team already has SEO resources in-house, an agency will often act as a trusted partner and resource for scaling your efforts. However, without an SEO resource in-house, the agency will be your primary go-to for your Local SEO needs. An agency will be able to provide your organization with a team of local SEO experts with proven experience and access to a full suite of tools. The purpose is to strengthen your local efforts without the additional strain and expenses of building out and managing a dedicated team in-house. For Local SEO efforts to be successful, there must be buy-in and support from the C-Level. The executive team should receive regular updates on the value and impact of your organization’s Local SEO efforts in order to secure the advocacy and budget for executing ongoing and new initiatives. For the Local SEO team, be sure that all reports and insights are high-level and directly tied to the value and ROI that your efforts create for the organization. Because SEO is ultimately a marketing discipline, your organization’s Local SEO efforts will require close collaboration with stakeholders throughout this department. Brand Management: The Local SEO and Brand Management teams must be aligned on the messaging for each of the locations being managed, especially when it comes to Local SEO reputation management. Content: In general, strong SEO performance requires strong content and close collaboration between these teams. Content must be optimized not only for on-page SEO best practices, but also for Local SEO factors to ensure that the content local-intent searchers find will be relevant and engaging. Paid Search: SEO and Paid Search performance are independent of each other, but with a high level of information sharing, both stakeholders can benefit each other’s efforts. For PPC stakeholders, awareness and collaboration on Local SEO efforts for particular store locations can strengthen how ad budget is managed. For SEO stakeholders, the performance data gathered from PPC campaigns regarding local keywords and engagement can be invaluable to making important strategic decisions around targeting and optimizing for organic local search. Close communication and collaboration is required here to ensure that any website changes as a result of local search optimization meet the requirements of the IT team and capabilities of the website. A strong partnership with the IT team can ensure quick turnaround with website updates, leading to stronger SEO momentum. Local listings management for hundreds or more locations will result in significant volumes of data. If utilized correctly, this data can be very insightful not only for making key local SEO decisions, but organizational decisions as well. The business analyst and local SEO teams can support each other by working closely on this data analysis to uncover meaningful insights. Your organization’s website plays a vital role in your local SEO success. Close collaboration with the web development team is a must to ensure that the website includes content and functionality for local-intent searchers. The local SEO team must also ensure that general SEO best practices are continually met by the web development team. While not necessarily within the confines of your organization’s office walls, individual store owners play a significant role in local search optimization. There must be close communication with store owners to ensure that local listings are accurate and up-to-date. Important local SEO pillars such as Reputation Management absolutely require buy-in, participation, and advocacy from the store owners who physically interact with your customers on a daily basis. Capabilities: Your chosen Enterprise Local SEO agency must have a broad skillset for fully understanding and acting on your local SEO objectives. When evaluating capabilities, be sure to take time during the discovery and sales process to ask the agency for high-level technical insights or evidence of past performance. Experience: When evaluating a potential agency for local SEO experience, start by exploring their website for examples of clients similar to your own or well-known organizations that manage multiple locations for local search. Other factors such as reviews, testimonials, media mentions, or even references from mutual contacts can be helpful as well. Reputation: Be aware of the agency’s reviews from current or former clients, as well as their activity in the local search ecosystem. The local SEO industry is closely connected, so the good (and the bad) actors are easily found. Case Studies: Explore the prospective agency’s website for case studies specific to local SEO efforts, especially for work closely related to your industry or organizational goals. Remember to ask for examples of results or past work to be sure that the agency meets your expectations. Technology Competence: Enterprise Local SEO is a complex and dynamic environment; your agency partner must be an expert at managing it. Not only should the agency have comprehensive SEO knowledge, they must be comfortable managing high volumes of data and capable of making impactful decisions. Many myths and misconceptions persist about Enterprise Local SEO throughout the marketing industry and across large organizations. This section will identify and dispel some of the most frequent ones that you may encounter. MYTH 1: Deleting your listings in Google will remove them permanently. Reality: Google receives data from many sources, and if your company’s listing data is still being syndicated through any of the local data aggregators, it might reappear on Google Maps. MYTH 2: Failure to claim your local listings will not allow your listings to rank. Reality: Even an unclaimed listing can rank. It is not ideal to leave a listing unclaimed as this means that you do not own your own local listing data, but it can still rank if left unclaimed. MYTH 3: Local SEO can be worked on without regular organic SEO. MYTH 4: Google Local support employees know the top ranking signals for Local SEO. Reality: Google Local support employees do not know what the top ranking signals are. This information is not shared with them. MYTH 5: Google displays whatever information is in your GMB dashboard. Reality: Google pulls information from all types of sources and if it deems another source more trustworthy, or if Google feels they can serve up a more user-friendly listing data from other sources, it will overwrite whatever you have listed in your GMB. MYTH 6: Links are out; citations are in. Reality: Citations are an important factor in local SEO, but not more important than high-quality backlinks from web pages that are relevant to your local page. MYTH 7: User experience does not matter with local. Reality: User experience always matters. Search engines like Google closely monitor how users engage with your listings and content. If users engage and there is a good dwell rate and no pogo-sticking*, you can expect your rankings to stay constant or increase. On the flipside, if people need to re-search after visiting your page, then the search engines will see this, deem your web page unhelpful, and then lower your rankings for that searched term. * In SEO, pogo-sticking is when the user jumps around between multiple results before they find something useful. MYTH 8: Google reviews are worth more than 3rd party reviews. Reality: Google reviews carry no extra weight over 3rd party reviews. Google looks at all review sources online and if schema is done correctly it can easily associate those reviews with your local listings. MYTH 9: Call tracking numbers are always bad. MYTH 10: Having a lot of micro local websites is better than having one website. Reality: Having more websites takes more work and doesn’t have the ability to pass authority onto your main website. Having keyword-loaded micro local websites is an outdated strategy that is no longer very effective. In parting, we hope that this playbook has helped you understand the complexity of Enterprise Local SEO and the potential it has for helping you meet and exceed your business objectives. It is not a quick-and-easy endeavour; Enterprise Local SEO requires patience and acumen.